Flask, nephlo Culture without cap. Side tube allows periodic monitoring of Flask contents using colorimeter or spectro photometer. Screw caps provide a scal & acess to either the Flask or tube portion for cleaning Flask can be used on plat form shaker. Fermbach, Culture Flask, Bottled Plain Neck. This wide mouth flask has a Delong style 38 mm neck for plastic or stainless steel closures. 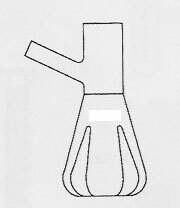 Triple baffles are located at the center of the flask bottom to achieve maximal oxygen transfer to culture medium closure are solid separately. This wide mouth flask is designed for culturing organising requiring a large surface area to volume ratio. Triple buffled on the bottom outside edges to achieve maximal GL 45 Blue Polypropylene Cap. Culture, Long Neck the long neck culture flask is basically an Erlenmeyer flask to which a long, straight, rimless neck of heavy tubing has been added. The longer necks reduce the amount of splashed solution reaching the closure. It is ideal for shaker cultters. Flasks are used for Converting homogeneous tissue Baffled. Samples into suspensions by digestion of connective proteins. Heavy beaded neck accepts cotton plugs. Four extra-deep bottles enhance vigorous agitation. Flasks are used for Converting homogeneous tissue samples into cell suspensions by digestion of connective tissues. Designed with a well below the sidearm to prevent unseparated tissues from being vigorous agitations. Sidearm is 16 mm OD. Delong style on flask and sidearm accommodates plastic closures sold separately.